For those of you who aren’t familiar with the popular Elf on a Shelf bonanza that happens every Christmas, let me briefly explain. Some genius came up with the idea to make a toy Elf that comes to your house Thanksgiving night and makes himself at home. This Elf supposedly watches the kids and then flies back to the North Pole every night to rat the kids out to Santa. 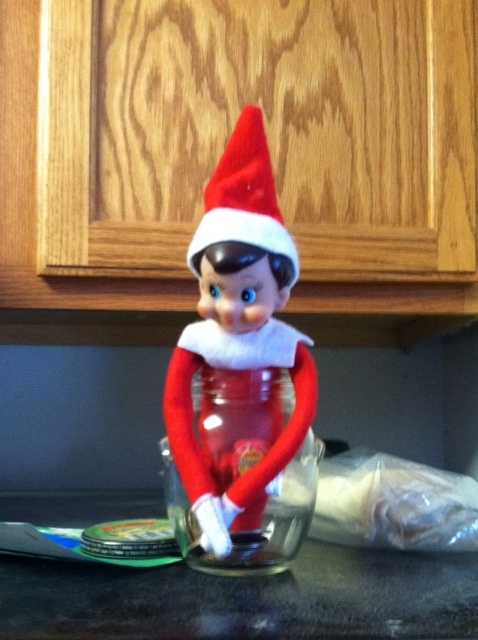 In the morning, the Elf is back in the house in a new spot, and the kids get to search for him. In theory, the Elf should deter the kids from misbehaving, since he reports back to Santa every night. To me, the Elf seemed labor-intensive for a parent such as myself, who’s admittedly somewhat grinch-like. I tried to avoid the Elf. After all, the kids’ teachers had Elves at school which seemed to keep them satisfied. Grandma, on the other hand, thought differently, and bought the kids an Elf a few years back (Thanks, Grandma . . .). Grandma and JC named the Elf “Eugene Peppermint” and happily shoved it at me. “Look what I got,” JC said. “Oh wonderful! You’ll have an Elf at Grandma’s!” I replied. “No! He’s coming to live with us,” JC insisted. “Lovely . . .,” said Grinch Mom (me), as I gave Grandma dirty looks. Eugene Peppermint. The Bane of My Existence. For the past couple of years, Eugene is a Christmas highlight for JC. He talks about him all year and gets super excited when it’s time for Eugene to come back to our house from the North Pole (a.k.a. my underwear drawer). Now that he’s older, he’s very serious about the Elf Rules, of which I’m not entirely sure. I think there’s something about not being allowed to touch the Elf because of magic? Maybe you have to rub peppermint on him if someone touches him? We aren’t allowed to touch him though. There are probably other things we are or aren’t supposed to be doing. I dunno. The Elf kind of stresses me out. Every night from Thanksgiving to Christmas I have to think of a place to put this thing. I live in a townhouse, people. There aren’t many places for an Elf to hang that are unreachable by the little, devious hands of JC’s little brother, M. (also known as “The Tornado” and “The Destroyer”). If M. gets his hand on Eugene, the magic is over. Well, on Day One, I was pretty good. I set up Eugene and wrote JC a note in “Elf handwriting.” Ahh, I thought. This is kind of nice to do for the kid. Yay, Christmas! Then on Day Two, I forgot about Eugene until I heard JC’s footsteps coming down the stairs in the morning. Luckily, that townhouse I mentioned has 3 stories, and JC sleeps on the top floor. I had about 30 seconds to move the Elf, but still, I did it. Last night, however, I forgot to move Eugene. He sat in the Christmas tree behind us while Joe and I watched Sunday night’s The Walking Dead. It was (finally) a good episode and we were freaked out and zombie-fied and went to sleep without a thought for Eugene hanging on our tree. 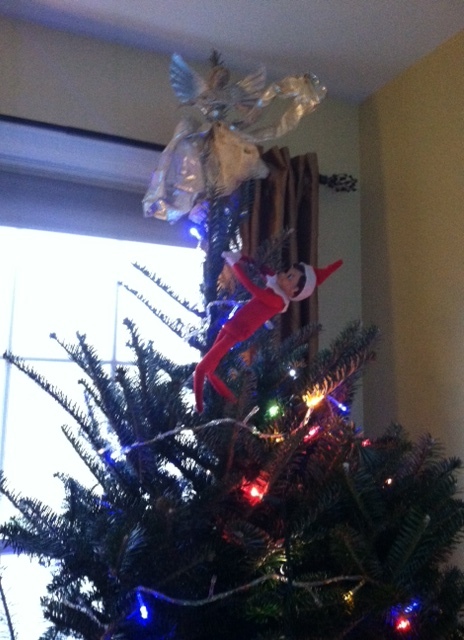 Nor did I remember this morning that I hadn’t moved Eugene from the Christmas tree until JC asked where he was. When JC discovered that Eugene hadn’t moved– that he hadn’t gone to the North Pole overnight to tell Santa how great JC behaved the day before– JC was very disappointed. I did what any good mom would do . . . I blamed dad. JC: Where is he? Where is he? Me: (Crap!) Umm, oh that silly Elf! He’s so mischievous he stayed in the tree! JC: What? Did you leave the door open for him? Me: (Brilliant!) Oh, you know what? Dad put the alarm on and Eugene couldn’t get out! That dad! He locked Eugene in! JC: WHAT? HOW COME YOU LET DAD PUT THE ALARM ON!?! Me: (Still my fault?) I didn’t see him put the alarm on! I texted Joe: We forgot to move the damn elf. I told JC you put the alarm on and he couldn’t get out. Eugene Peppermint hanging in our tree. Day Two. Anyway, this afternoon I came home from lunch, moved the Elf onto a (wait until you hear THIS originality . . .) SHELF, and left a note in Elf Handwriting to JC blaming Joe for locking him into the house. Eugene asked JC to please remember to keep the door open. Time ticks and I bring JC home after work and he runs in looking for Eugene. His brother and grandparents are at the house, the dog is excited, it’s a little chaotic to say the least. JC and Grandma find the Elf on the Shelf (literally) and JC is happy. I’m not kidding you– no more than three minutes later, the Elf is gone. Missing. Nowhere to be found. Frantically, the grown ups search the house. “Ma, where’s the Elf?” I whisper to her, hoping she hears the urgency in my voice. “WHERE’S. THE. ELF. ?” JC starts with his brattitude, freaking out and doing his fake hyperventilating cry, getting ready to wail as the whimpering begins. What was I thinking at this point? Well, besides thinking I needed a drink, ear plugs, and/or a place to hide, I thought: Holy crap. For a number of reasons: (1) Holy crap, the dog ate the Elf and I’m going to have to bring her to the animal hospital and JC will hate her forever; (2) Holy crap, my parents are losing their minds and they moved the Elf and don’t know where they put it and I’m going to have to put them in a home; (3) Holy crap, M. picked up the Elf and threw it into the abyss (the hole created by placing bookcases next to each other in a corner (I’ll snap a picture) and I’ll never get it out; (4) Holy crap, where am I going to go to find a new Elf to replace Eugene before morning; (5) Holy crap, the damn Elf IS MAGICAL and FLEW AWAY . . . maybe to the North Pole to tell Santa what a crappy mom JC has. 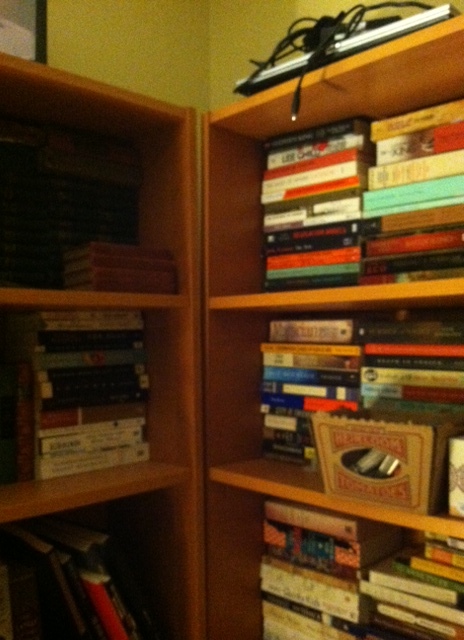 The Great Abyss exists in the empty space created in the corner by the edges of these two bookcases. I’ve fished things out before, but I know that the hole holds many lost treasures, unreachable by the spaghetti scooper duct taped to the broom tool. After about ten minutes of searching, Grandma spotted the Elf. On the fridge. My parents insisted they weren’t messing with me, so the only explanation is that M. grabbed the Elf, climbed onto the garbage can to the counter, and put Eugene on the fridge, then hopped off without anyone knowing. Which is concerning for a number of reasons, including that three adults didn’t notice the autistic kid climbing the counters. That’s the only thing we can come up with to explain Eugene’s jump from the shelf to the fridge. Unless, he really IS magic. Thanks for reading and have a nice night. I have to go move the stupid Elf. You’re right! They are totally creepy. He just sits there and STARES at us…. Ugh. Good luck with your project! Invent something creepy like the Elf and make millions! What a story! This should be shown to any single person or childless couple so they can get a tiny glimpse into what one must do to be a somewhat decent parent. This also will help them to understand that their once sane (ish) parents will turn into complete crazy people when the grandchild arrives. Well, it makes us stronger I guess! OMG! A live animal? I shouldn’t complain about Eugene Peppermint. At least I don’t have to feed him. You’re right about grandparents. Give them a grandbaby and crazy stuff starts to happen. I have no idea what goes on at my mother’s house when she’s watching the kids and I’m not there. They have secrets. I’m actually kind of glad I don’t know! Just be assured…most of the secrets have to do with being spoiled and not having many rules. Funny how parents can be so protective and demanding of their own children but toss the book of parenting out the window when it comes to the grandchildren! I hate the idea of the Elf as well, but I do miss the innocence of a child who wants toys for christmas, and not a $2,000 computer. Teens don’t care if the Elf rats them out … they’ll meet him in the dark corners of the laundry room and send him to Santa, bald as a baby bird and with his Elf-smirk Sharpied right off his little mug. HAHAHA! I’d hate to be a teenager’s Elf. It is nice when they are little to go to walmart and buy them a bunch of (cheap) toys, that look really nice under the tree wrapped up. With the big kids asking for one big ticket item, there’s only one thing to open (if they waited for Christmas morning before demanding their loot). Then they spend the rest of the day, and possibly the year, “setting it up” and staring at it. Who knew a creepy little Elf could cause such strife? I’d apologize for giving him the Elf, but it made him so happy I am more than willing to take the heat for it. That’s g’mas mission…make them happy. Yes, yes. As long as you don’t give them anything live that I have to feed or walk, we’re good (see Steve’s comment above). Thanks for the laughs….great way to start my day!! It’s all fun and games, Rachel, until you’re the parent! Someday you’ll see, when you have kids and the Elf hits the U.K. You should see some of the stuff the good moms do- you’d love it. For example, one mom filled her bathroom sink up with baby marshmallows, stuck the elf in it, and put a barbie doll in there too. Looked like an elf partying in a hot tub. Some families make the elves mess up the whole house overnight. Which to me just means I’d have to clean it up in the morning. Personally, I think it would be fun to cover the elf in peanut butter and leave it in the dog’s crate to see how he fares. Somehow I think my sons wouldn’t be too impressed! hahahahahha! I have a blast seeing what everyone is doing with their Elf, and the ideas on Pinterest are amazing – but thank goodness the Elf didn’t exist when Mr. T was little! I couldn’t have done it, I wouldn’t have done it! Dobby! What a great name for the Elf. I have to admit I enjoy seeing what people name the Elf. If the Elf came out when Mr. T. was little, you would have done the hocus-pocus stuff too, like the rest of us suckers! You probably would have set him out in a Halloween costume and left him up until Christmas. If you can think of a similar halloween type toy, you can be a gazillionaire! Get to work! An elf infestation sounds hard. The exterminator refuses to deal with them. All we can do is wait it out. On the 26th he’ll go back in the underwear drawer. Absolutely amazing post! I read it to my 12 yr old daughter and we laughed, feeling like we were a part of it, too. And you only proved how much of an awesome mom you really are! Nicely done! M knows the game! JC has 3+ people playing it with him. That’s pretty cool! This essay was simply BRILLIANT and needs to be Freshly Pressed. Thank you for the great read!